I love Gruyere cheese, but I don’t like the price tag that comes with it. Sometimes, I will break down and buy it; but I most often just substitute sharp Swiss cheese in its place, which ends up working just fine since Gruyere is in the Swiss cheese family. Happy day. I made this quiche for our Sunday brunch over the weekend. I was testing it out for a possible menu item for my friend, Chelsea’s, bridal shower in May. Asparagus is so delicious in the spring and I thought it would fit well into her brunch-themed shower. The flavors were quite tasty, but the crust came out a little underbaked. I will definitely be making this dish again, but I may pre-bake the crust for a few minutes and then add the filling to ensure a perfectly crispy crust. Most importantly, the bride-to-be gave her seal of approval. 1. Make the pie crust: whisk together the flour, salt, and sugar in a bowl of an electric mixer with the paddle attachment. Add in the butter and mix on medium-low speed until the mixture resembles the size of peas. With the mixer still on low, gradually add in the ice water until the dough just starts to come together. 2. Dump the dough onto a lightly-floured surface. Form it into a 3/4 inch disc ball of dough. Wrap in plastic wrap and refrigerate for at least an hour. 3. After the dough has chilled, place the disc on a lightly-floured surface and use a rolling pin to roll the dough into a 14 inch circle, about 1/8 inch thick. Carefully drape over a 9 inch pie plate. Pat the dough down and crimp the edges. Refrigerate for at least 30 minutes. 4. Make the filling: Preheat oven to 350 degrees. Remove the pie crust from the oven. In a large saucepan, melt the butter over medium heat. Add leek and asparagus; season with salt and pepper. Cook until asparagus is crisp-tender, about 6 to 8 minutes. Allow to cool slightly. 5. Whisk together eggs, half-and-half, 1/2 teaspoon salt, teaspoon pepper, and a pinch of nutmeg in a large bowl. Sprinkle with swiss cheese and top with asparagus mixture. Pour egg mixture on top of the cheese/vegetables. 6. Bake until center of quiche is just set, 50 to 60 minutes, rotating the quich halfway through. Allow to set 15 minutes before serving. It was phenomenal!!! (As is everything on here I’d have the privilege of taste testing!) I even brought a tiny bit of the bread pudding in to work so Anna would feel like she could be a part of your blog – you should post that recipe too! Aw thanks, Chels! I can’t wait for your shower. I will definitely put the bread pudding recipe up soon! Glad you liked it. I was worried it might be a bit too soggy. I agree, Nicole. Asparagus is one of my favorite things about spring. I am sure you have some great asparagus recipes up your sleeve! did I send you the quiche recipe I a made a few months back? the one I made for Sara’s party? it’s a Martha’s adaptation too and the custard filling was heaven,you make your own creme fraiche(sp?) day before and difinetly prebake the pate brise crust.Give it a try,the custard will inspire you .Any big plans for little jack’s bday!? Ok seriously kicking myself (honestly). You DID send me that recipe and I totally should have made it. I am sure it was delicious. I need to test that one too. NOMNOM. I think we’re throwing little J-man a small party out in CO. I will be sure to post lots of pics! I do have some of that Gruyere cheese, so this would make perfect use for it. 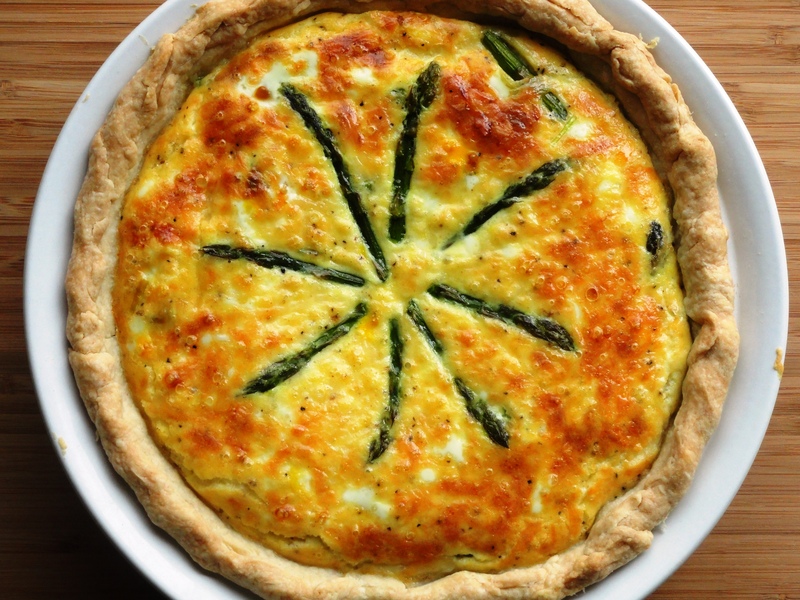 I like the asparagus leek blend in this quiche and I am sure it was delicious. Glad the bride to be approved it! Have a great day. Sun dried tomatoes sound like a great substitution!